The Mexican Bus will be at 24th and Mission for seniors and those who can't march the entire distance. 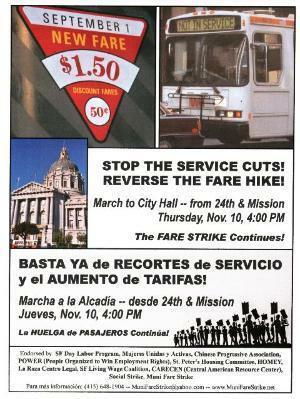 Organizing for the November 10 Community March Against Muni's Service Cuts and Fare Hike is picking up steam. Muni management is doing much of the organizing for us -- more and more people are complaining about longer and longer waits and insanely-crowded buses. The southeast part of the city is probably the hardest hit. Try standing at Geneva and Mission for awhile and you will see throngs of unhappy and nearly-desperate riders, overwhelmingly people of color. Yet, last Thursday, Camelot Mayor Gavin Newsom announced a new program for Muni that will have "one of the most significant impacts in terms of quality of service and the quality of customer satisfaction." More buses? Bring back the $1.25 fare? Not hardly. 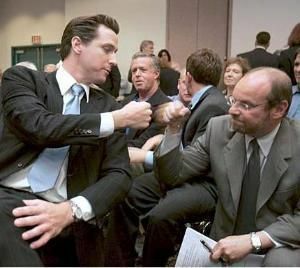 No, Newsom is planning on spending over $11 million dollars to install a high-tech system that will allow better-heeled Muni riders to get an electronic message on their handheld computers telling them when the next bus will arrive. That $11 million is millions more than the city expects to gain from its recent fare increase. In other words, the most needy Muni riders are having their pockets picked so the Mayor can fund a new toy for his yuppie computer nerd friends. Meanwhile, we have received reports that people calling Muni's information line are waiting up to 15 minutes to get an answer, apparently as a result of service cuts in that department. Even finding a store to buy a Fast Pass -- if you can afford one -- is getting harder, as several stores in the Mission have stopped selling them, throwing up their hands in the face of Muni's small sales margin and time-consuming paperwork. "Our transit system -- run by an interim chief with minimal relevant experience -- is in a financial death spiral, as service cuts lead to reduced ridership, and the resulting reduced income from fares leads to budget shortfalls, which lead to more service cuts and still fewer riders... Yet our mayor retains a media reputation, crafted during this election campaign, as a transit-policy wonk." The SF Weekly article in which this comment appears details the diversion (perhaps theft is a better word) by San Francisco politicians of $13 million from a state fund for "safe neighborhood parks, clean water, clean air, and coastal protection" in order to fund the recent golf tournament at Harding Park near Lake Merced. Incredibly, $5 million of that money was supposed to be used for "high priority, urgent, unmet needs, in the most heavily populated and most economically disadvantaged areas." It certainly would have been much easier to justify using that money to add some Muni buses so people in "economically disadvantaged areas" could actually get to a park or a beach on occasion. All of this takes place against the backdrop of an ever-increasing economic crisis for those of us who aren't walking around with a handheld computer or planning our next golf game. The cost-of-living went up faster in September than at any time in the last two decades. A lot of that increase went directly into the coffers of the big oil companies -- Exxon, Shell and our local Chevron reported a record $22.5 billion in profits for the last quarter. PG&E is telling us to expect to pay 50% more for natural gas this year. Sunset Scavenger wants a 40% rate increase for our garbage pickup. And the feds are plotting to take food stamps away from 300,000 people and cut off school lunches and breakfasts to 40,000 children. Muni's service cuts and fare increases are just one aspect of this crisis for the poor and disadvantaged. But it is one that targets, and thus unites, thousands and thousands of working class folks. There's an election on Tuesday, and there are many important matters on which voters should weigh in. But the struggle for a decent life for ourselves and our children will go on, however the election turns out. In any event, many Muni riders can't vote because of their immigration status. These riders, who deserve dependable and affordable public transportation as much as anyone, have no choice but to vote with their feet. No surprise then that the Thursday march was initiated by the San Francisco Day Labor Program, an organization made up primarily of immigrant workers. Other organizations participating in the march now include Mujeres Unidas y Activas, POWER (People Organized to Win Employment Rights), the Chinese Progressive Association, St. Peter's Housing Committee, HOMEY, La Raza Centro Legal, the SF Living Wage Coalition, CARECEN (Central American Resource Center), Social Strike, and Muni Fare Strike.